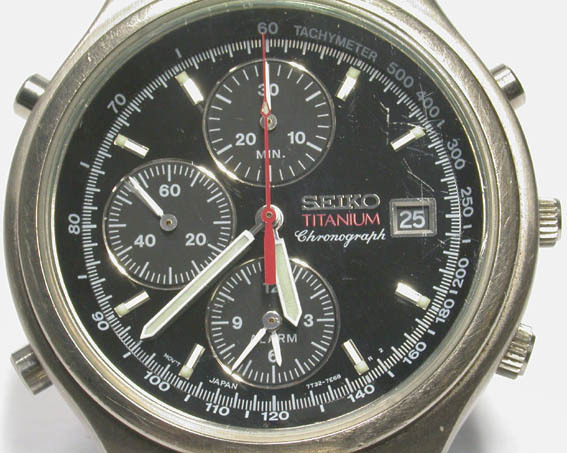 Tachymeter - How to use ??? Tachymeter is a calculator on our wrist. However, most people only treat it as a decoration. The scale of the watch above is number of work can be done per hour. Find the AVERAGE speed of a moving car between point A & B with a distance 1000 m ( 1 km ). If the car spends 30 seconds to finish this 1000 m, the red hand will point at the reading 120. This means the car can finish 120 x (1000 m) / hr = 120km / hr. If the testing distance is shortened to 1m but the time remains the same, the answer will be 120m / hr. Find the total number of paper boxes can be folded in one hour. If an machine can fold a paper box in 20 seconds, the red hand will point at 180. This means 180 paper boxes can be folded in one hour. You may see that the scale at the beginning is tighter (500 -> 400 = 2 sec.) than that at the end (70 -> 60 = 8.4 sec. ); therefore, the shorter the time taken, the more the error due to your reaction time or other factors. Use example B again, but this time, we count the time taken after 2 boxes are folded. According to the answer from example B, we could find the reading is 40 sec or 90. But the actual reading may be 39 sec. only. As a result, the red hand will point at about 92.5; this means 92.5 x (2 boxes) / hr = 185 boxes can be folded in one hour. 5 more per hour !!! The time taken must be equal to or less than 60 sec.